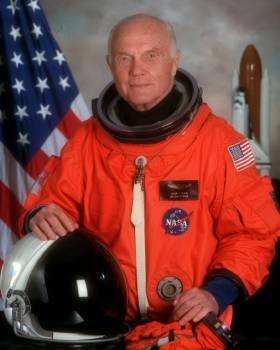 John H. Glenn Jr., one of America’s original Mercury Seven astronauts, in 1962 became the first American to orbit the earth. Thirty-six years later, at age 77, he spent nine days in space aboard Space Shuttle Discovery. He was born in Cambridge, Ohio, on July 18, 1921. While a student at Muskingum College, Glenn learned to fly, then left his studies in 1942 to enter the Naval Aviation Cadet Program, later receiving a Bachelor of Science degree from Muskingum. He was commissioned in the Marine Corps in 1943, and served in the Marshall Islands, flying 59 World War II combat missions in F4U fighters. After the war, Glenn flew reconnaissance missions in the Pacific and later became an instructor in advanced flight training at Corpus Christi, Tex., and then attended Amphibious Warfare Training at Quantico, Va. During the Korean War he flew 63 combat missions in 1951 and 1952 in F-86 Sabre jets. In the last nine days of fighting in Korea he shot down three North Korean MIG fighters. Following Korea, Glenn was selected for test pilot training, and in 1957 he set a transcontinental speed record from Los Angeles to New York in an F8U jet, the first such flight to average supersonic speed. NASA selected Glenn as one of the original seven Mercury astronauts in 1959. On February 20, 1962, he became the first American to orbit the earth, circling the globe three times in 4 hours 56 minutes in the Mercury capsule he named Friendship 7. Near the end of the flight, radio data indicated Glenn’s heat shield might be loose and could not protect him from the searing heat of re-entry. Mission Control directed him not to jettison his retrorocket package after firing it, instead keeping it strapped to the shield to hold it in place. There was no real problem and Friendship 7 landed safely after a trip of 81,000 miles. After 23 years of military service, Colonel Glenn retired from the Marine Corps in 1965, and left NASA to pursue a business career with Royal Crown International, rising to the post of president. He entered the Ohio U.S. Senate races in 1964 and 1970 and eventually won a Senate seat in 1974. He was re-elected in 1980, 1986, and 1992. In 1997, he began a campaign to return to space to study the effects of weightlessness on the aging process. NASA agreed, and on October 29, 1998, he and six crewmates blazed into orbit aboard the space shuttle Discovery for a successful nine-day mission. Glenn did not seek reelection to the Senate in 1998, and retired to write a book about his life, “John Glenn: A Memoir.” He and his wife, Annie, have homes in Columbus, Ohio, and Bethesda, Md. Glenn is a Founder of the Astronaut Scholarship Foundation and he serves on its Board of Directors. John Glenn was inducted into the U.S. Astronaut Hall of Fame on May 11, 1990.